The city of San Diego marked the 250th anniversary of the arrival of the Spanish sailing ship, San Antonio, into San Diego Bay with a special event involving the Kumeyaay Nation and a vessel from the San Diego Maritime Museum. The first Spanish settlers arrived into San Diego on April 11, 1769 and a ship from the San Diego Maritime Museum was docked off of Embarcadero Marina Park North to symbolize the milestone. 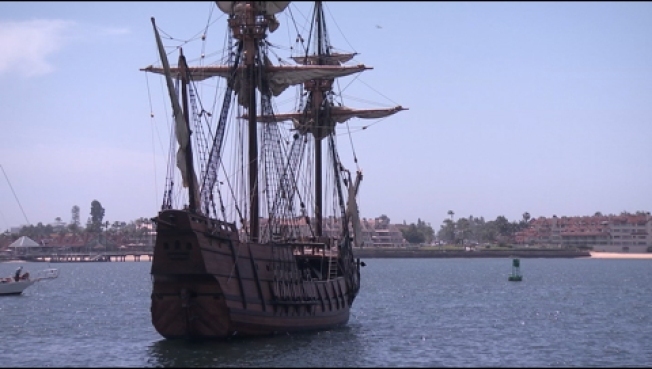 The Port of San Diego gathered local officials as well as port commissioners and tribal leaders of the Kumeyaay Nation to commemorate the arrival of the Spanish. It's important to recognize the region's first people as part of a yearlong effort to mark the 250th anniversary of the establishment of San Diego by the Spanish. "We appreciate the opportunity to share our true history and look forward to creating a healing environment in which all the people of this region can come together for a bright future," Chairwoman Elliott Santos said in a written release. Residents will see the San Salvador anchored offshore, representing the Spanish vessel the San Antonio. Mission Basilica San Diego de Alcala is also holding special events all year to celebrate its establishment in 1769. According to the mission’s website, the site is known as "the birthplace of Christianity in the west coast of the United States" and also recognized by many as the "birthplace of San Diego."